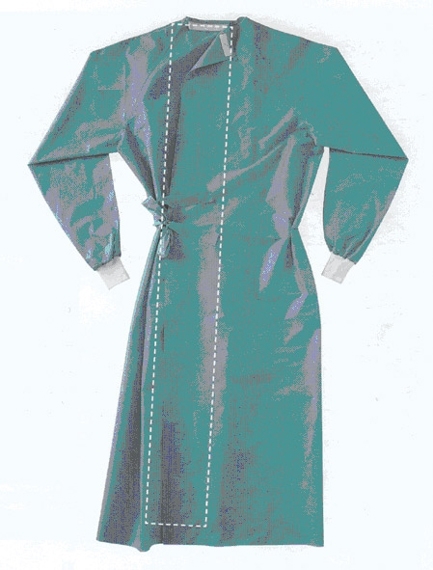 A sterile wraparound gown worn over clean clothing (shirt, trousers), used during aseptic medical or surgical activities. The gown is resistant to liquid and microbial penetration, and has a minimal release of particles. Nonwoven fabric: Spunbond-Meltblown-Spunbond (SMS or SMMS fabric). - Neck fastener and reinforcements: cellulose polyester. - Cuff: polyester or jersey. - Wraparound: back closure with back panel flap (covering), braided side fastener, reinforced chest area and adjustable neckline. - Long raglan sleeves with reinforcements at forearms for medium OP with medium water flow. - Colour: green or blue. 1 gown, sterile, aseptic folding, double packaged, single-use. Sterile gowns must be supplied with double packaging: the interior layer in a sterile peel pack. Unit presentation primary packaging: Products name, size and reference number; "sterile" with sterilization method; lot number, expiry date by year and month; "for single use"; and CE mark and reference number of notifying body. Must be multilingual: English, French and Spanish, others when available. Protected unit, labelling is the same as unit presentation. Additional required information: Number of units per secondary packaging. Information for product-specific storage conditions (e.g., temperature, pressure, light, humidity, etc. ).